NuYarn® is an exciting development in the realm of yarn, the brainchild of TMC Innovations in New Zealand. 35% Loftier than conventional Merino. Because NuYarn has no twists, fabrics feel more comfortable on the skin. Nuyarn creates lower density, loftier fabrics, which means a light weight garment that behaves like a heavier one. 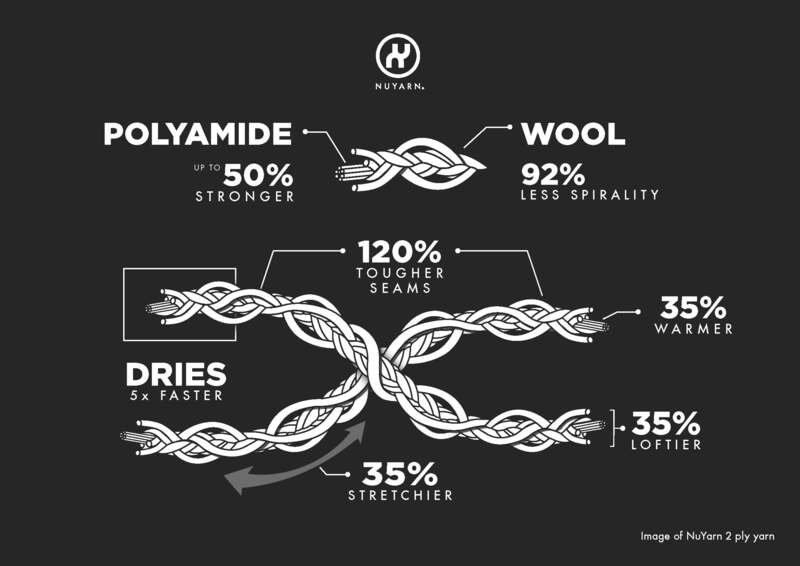 Dries 5 x Faster than conventional Merino. The interior of Nuyarn fibre absorbs and desorbs a large amount of moisture vapour without feeling wet. This results in garments with improved breathability and comfort. 35% Warmer than conventional Merino. Nuyarn produces loftier yet lighter fabrics, with up to 35% more thermal resistance. Insulating air in the garment. 47% Stronger than conventional Merino. Nuyarn's burst strength improvements allows garments to be much more durable and resistant to abrasion. This makes it the perfect choice for performance clothing, which is often subjected to constant movement and hard wear in testing conditions. At the cornerstone of our socks stands the worlds greatest fibre, Merino Wool. After all our years in sock manufacturing we've seen it and tried it all, through all this nothing has complimented our technology better than Natures hardest wearing fibre. Merino is a complex keratin protein-based fibre that shares a close compatibility with human skin, nails and hair. This makes merino fibre a natural, harmonious choice when selecting hosiery to wear next to your skin and provide protection for the foot. Sourced from ethical suppliers the world over we use our merino intelligently. Utilizing different counts best suited to each application we guarantee that you will get the best wear out of each sock. Lightweight, strong, moisture wicking and breathable, Merino wool offers comfort in both hot and cold environments. It's natural properties ensure it is breathable while resisting odour and maintaining low irritant qualities to preserve skin integrity. The Australian brush tailed possum was introduced to New Zealand in 1837 and pest control measures have been in place ever since. The possum is the single largest contributor to Native plant, insect and Bird destruction - with some species wiped out entirely, as well as being a key player in the spread of bovine tuberculosis. The ongoing eradication of this pest ensures the survival of our unique New Zealand ecosystem. New Zealand is renowned for big ideas. Ideas that send ripples around the globe. As far as ripples go, Nuyarn® technology is a pretty big one. Enhancing the raw materials you already use, Nuyarn® takes the twist out, and instead lays the fibres along the same orientation as the rest of the yarn. We take your best and make it better. The Schoeller Spinning Group is a global supplier of yarns with a particular focus on worsted yarn. We offer a large range of products and we work in close collaboration with our customers. We firmly believe that spinning together will yield the best solutions.